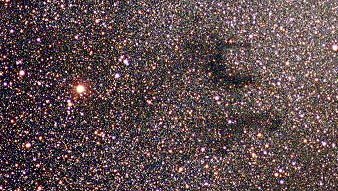 left of the dark nebula. 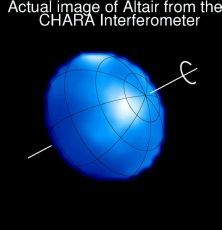 Altair is a white main sequence dwarf star of spectral and luminosity type A7 V-IVn. According to various estimates, the star has about 1.7 times Sol's mass (RECONS), 1.8 times its equatorial diameter (JPL press release, 2001; T. Moon, 1985; Morossi and Malagnini, 1985, page 369; and Johnson and Wright, 1983, page 695), and about 10.7 times its visual luminosity and 9.845 its bolometric luminosity (NASA Star and Exoplanet Database, derived from of Kenneth R. Lang, 1980). 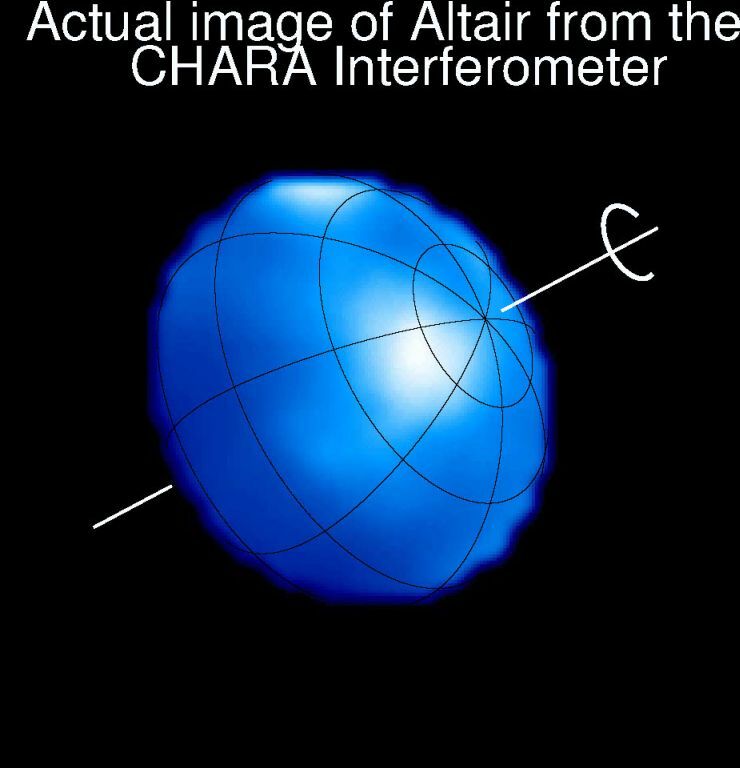 Like Sirius, however, Altair radiates much more in ultraviolet wavelengths than Sol, and, not surprisingly, the European Space Agency has used ultraviolet spectral flux distribution data to determine stellar effective temperatures and surface gravities, including those of Altair. Altair is 14 percent wider than it is tall (see video). 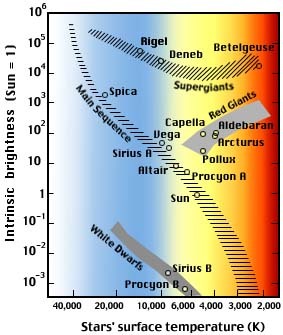 Based on Altair's abundance of iron, the star appears to be twice as enriched as Sol with elements heavier than hydrogen ("metallicity"), (Cayrel de Strobel et al, 1991, page 306). Not surprisingly, dust has been detected around this young star (Kuchner et al, 1998 -- in pdf). According to Holweger et al (1999), this dust disk may have developed after most of the surrounding nebulae of gas has been absorbed or expelled as a shell of gas from the developing star before it reached the main sequence. Altair has the New Suspected Variable designation NSV 24910 and is unusually bright for its spectral type and so may be becoming a subgiant star that is beginning to evolve off the main sequence, as it begins to fuse the increasing amounts of helium "ash" mixed with hydrogen at its core. Although the star should be only a few hundred million years old, it is so much bigger and hotter than Sol that it will exhaust its core hydrogen around only a billion years and turn into a red giant or Cepheid variable before puffing away its outer layers to reveal a remnant core as a white dwarf. has been directly imaged (more). Altair has one of the fastest known rotational speeds -- 210 kilometers per second (131 miles per second)-- and so completes at least one rotation in about 10.4 hours. By comparison, the rotational speed of Sol is only 25.4 days at its equator. As a result of the rapid spinning, the star probably has the shape of a flattened ellipsoid, where the equatorial diameter was estimated to be 14 percent greater than the polar diameter in 2001. Useful star catalogue numbers for Altair include: Alp or Alf Aql, 53 Aql, HR 7557, Gl 768, Hip 97649, HD 187642, BD+08 4236, SAO 125122, FK5 745, LHS 3490, LTT 15795, LFT 1499, and ADS 13009 A. According to one type of model calculations performed for the NASA Star and Exoplanet Database, the inner edge of Altair's habitable zone is located relatively far from the star at around 2.177 AUs from the star, while the outer edge lies even farther out at around 4.475 AUs. The distance from Altair where an Earth-type planet would be "comfortable" with liquid water is centered around 3.3 AUs -- at the outer reaches of the Main Asteroid Belt's orbital distance in the Solar System. At that distance from the star, such a planet would have an orbital period of around 4.7 Earth years. If there is life on any Earth-type planet orbiting youthful Altair, it is likely to be primitive single-cell, anaerobic (non-oxygen producing) bacteria under constant bombardment by meteorites and comets as Earth was for the first billion years. Since there is unlikely to be free oxygen in the atmosphere of such a planet, it probably would not have an ozone layer (O3) although Altair puts out a lot more hard radiation (especially ultraviolet) than Sol. A search for faint companions using the Hubble Space Telescope from 1995 to 199 found no supporting evidence for a large Jupiter or brown dwarf sized object (Schroeder et al, 2000). On the other hand, the failure to find large substellar objects like brown dwarfs or a Jupiter- or Saturn-class planet in a "torch" orbit (closer than the Mercury to Sun distance) around Altair -- with even the highly effective radial-velocity methods of Geoff Marcy and Paul Butler -- bodes well for the possibility of Earth-type terrestrial planets around this star. The following star systems are located within 10 light-years of Altair. 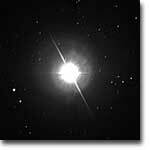 Try Professor Jim Kaler's Stars site for other information about Altair at the University of Illinois' Department of Astronomy. Located at the celestial equator, Constellation Aquila, the Eagle, and Constellation Cygnus, the Swan, were hunted by Hercules. Along with a third, the Vulture (renamed in later as Constellation Lyra, the Lyre), the birds comprised one of the tasks (the Stymphalian Birds) of Hercules. For more information about the stars and objects in this constellation and an illustration, go to Christine Kronberg's Aquila. Another illustration is available at David Haworth's Aquila.